While there he began work on paintings based on The Divine Comedy by Dante Aligheri beginning with The Inferno. The Inferno consists of 34 Cantos (sections) and Walsh made 24 paintings based on the first 24 Cantos. On his return to Ireland he made 10 more and then began the work of repainting all 34. These were finished in 2005. He subsequently completed seven large paintings based on the seven cornices of Purgatorio, the second book of The Divine Comedy; and one multi-part painting based on the third and final book: Paradiso. He also made a number of drawings and studies on the same theme. 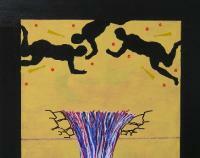 The Divine Comedy work was shown for the first time at the Limerick City Gallery of Art, November-December 2007. The Inferno section toured to Centre International d'Art Contemporain, Pont-Aven, Brittany, FRANCE, May-June 2008. The Divine Comedy got its second full showing at the Triskel @ ESB: Caroline St., Cork, January-February 2010. 'Two Drawings from The Purgatorio,' St Nicolas's Church, Westbury, Limerick, May-July 2015. The Swiss/Irish composer John Wolf Brennan has created a piano sonata dedicated to Sam and entitled The Divine Cosmody, based on Dante's three books. The music is avaiable on the CD 'The Speed of Dark', Leo Records CD LR 543, released in 2009. * see Biography & Residencies.